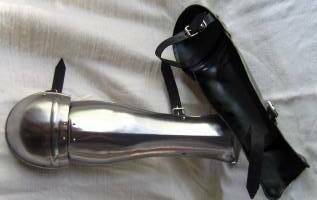 greave is a piece of armor that protects the leg. These Greek Folded Greaves are a simple example of early leg armor that was designed with function in mind. These greaves protect the front of your leg, while still providing a range of mobility. The only specific difference between these greaves and authentic Greek replicas are that Greek hoplites typically favored bronze greaves, mostly because bronze was the more prominent metal of the age. These folded greaves provide protection to the front of the leg, stretching from the ankle to the knee. These Greek Folded Greaves have a sleek, polished steel look that differs slightly from the classic Greek look, but still makes for a great piece of protection for any re-enactor who wants to ensure the safety of his legs.